The U.S. Patent and Trademark Office earlier this month approved for publication a trademark application from Apple for the term "iPod touch" that would extend protection to cover "Hand-held units for playing electronic games; Handheld game consoles" under International Class 28 (games, toys, and sporting goods). Portable and handheld digital electronic devices for recording, organizing, transmitting, manipulating, and reviewing text, data, audio and video files; computer software for use in organizing, transmitting, manipulating, and reviewing text, data, audio and video files on portable and handheld digital electronic devices. As part of its justification for the new trademark application under gaming consoles, Apple submitted a screenshot of its iPod touch overview page scrolled to the "Gaming" section, with red arrows calling out the product name and the "Buy" button. The iPod touch has of course been a handheld gaming console since its launch over a decade ago, so it's unclear why Apple has waited until now to extend its trademark coverage to include the area. It could be a purely defensive move to protect against competitors or other challenges, but given rumors last week of Apple working on a seventh-generation iPod touch some three and half years after the last update, there's naturally some speculation that there could be more to this. We haven't heard any specific rumors about what to expect in a seventh-generation iPod touch, but we expect Apple to keep spec upgrades fairly minimal in order to maintain a low price point to appeal to customers who can't or don't want to step up to an iPhone. Apple's new application will be published for opposition on February 19, and unless viable third-party opposition to Apple's claim appears, the company will be granted the trademark later this year. Hopefully they're keeping this thing around. I remember it being a great introduction into the iOS ecosystem when I was a kid, and using the iPod as a game console evokes a sense of nostalgia. Actually now would be the perfect time to introduce new iPod Touch models with these crazy AF iPhone and iPad prices. 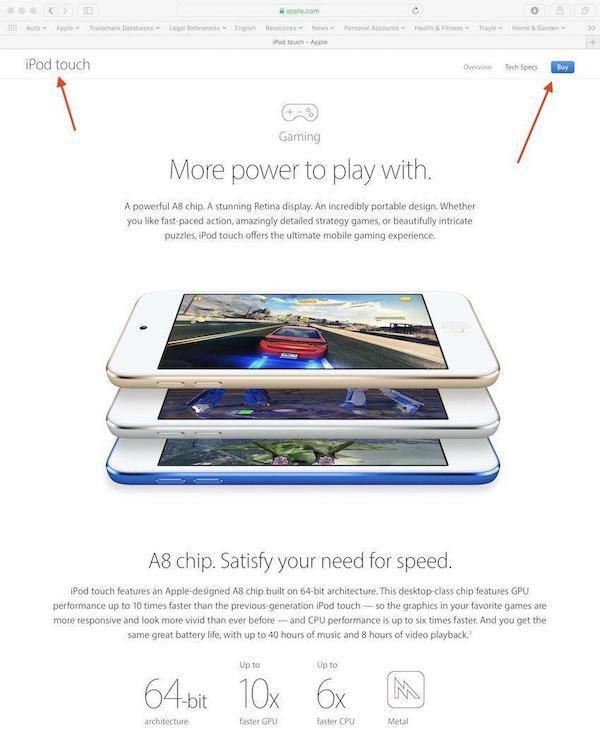 Next generation iPod touch is going to be 4.7 inches, the size of an iPhone 6 and processor of the iPhone X. It will be marketed as a gaming device and will not be updated for another 3 years. Hmmm, let's see, how can we re-purpose all of this crap we have left over when people didn't buy the iPhone..? I know, we will leave out the phone stuff and resurrect the iPod touch. And we will call it fancy. If/when Apple releases an update iPod touch (assuming ~$200 USD), it'll be an instant buy for me. I like to have a dedicated device connected to my audio system for streaming music that has no personal info on it so it can be left without a passcode turned on. This way guests can just queue up songs etc as they want. I had always hoped MFI controllers would take off more than they have. We have so much power in iPhones now, more than the Switch which can run AAA games like Doom. A Switch-lite experience with one of these is what I want them to push for and court developers for. how is this different from a wifi-only iPhone? Light and small. There's nothing else like it. At home it's my iPhone. I only have a large screen phone so I can see it on my dash, where it's my Nav/Entertainment.